A resident of Aiyali Kalan village today alleged that his brother had tried to abduct his father, who was suffering from a neurological disorder. 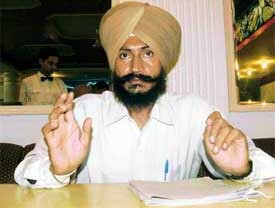 The All India Congress Committee (AICC) is learnt to have pre-empted an otherwise imminent showdown between the supporters of the Chief Minister, Capt Amarinder Singh, and the family members of late Beant Singh during his death anniversary function being organised at Kotli, his ancestral village near Payal on August 31. 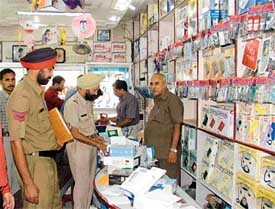 Unidentified burglars broke into a mobile telephones selling shop near Baba Than Singh Chowk and decamped with mobile sets worth over Rs 6 lakh last night. The burglars entered the shop after breaking the locks of a door that opens in a street. More than 60 sets of Nokia brand, most of them valued at Rs 20,000 were stolen. Fruit and vegetable commission agents (arhtiyas) throughout the state will not pay market fee on all transactions on Monday (Aug 30) and if the government failed to respond to their demand for justice, they would observe a day’s strike on August 31. Cutting across political and social affiliations, many people paid tributes to Leela Wati, wife of Mr Harnam Das Johar, Education Minister, Punjab at a Shardhanjali Samaroh organised at BCM Public school here today. On the eve of the death anniversary of former Chief Minister, Beant Singh, his life-size statue will be unveiled at a function by Mr H.S. Hanspal, PPCC chief, at Doraha tomorrow. Cardinal Telesphore P Toppo, who is also president of the Catholic Bishop Conference of India inaugurated the Christ King Church and Sacred Heart Convent School at Sahnewal near here today. Arch Bishop of Delhi Vincent and leading members of the community were present on the occasion. 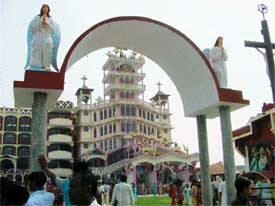 The Chruch is located on the GT Road between Sahnewal and Doraha. A drama was witnessed in Vishawakarma Colony yesterday when a resident of the area weighed LPG cylinders being carried by a vendor and found that they weighed 1.5 kg less than the required weight. Activists of the Hindu Suraksha Samiti, led by district president Rajeev Tandon today organised a demonstration against widespread corruption in all government departments. Carrying banners and placards the samiti workers commenced the protest march from Sham Singh Road and went up to Bharat Nagar Chowk where a rally was held. Rajeev Bhasin who is contesting the elections to the Panjab University senate has promised transparency in varsity work. He also promised to get fee structure rationalised in the university. One more DA instalment at the rate of 3 per cent has become payable to Central Government Employees and pensioners with effect from July 1, this year, as per all-India consumer price Index. In a communication to the Union Finance Minister, Mr P. Chidambaram, the Government Pensioners Association has urged him to release the DA instalment and pay the DA arrears in cash before Dashera which falls in October. Imported rakhis have overtaken Indian rakhis. Chinese rakhis have flooded the market and the range is mind-boggling. As rakhi draws near, rakhi-sellers have reduced the prices. A seminar on “Rural development through education”, in association with the District Education Department, Fatehgarh Sahib, was organised at the Desh Bhagat Institute of Management and Computer Sciences here on Friday. Nearly 125 heads of high and senior secondary schools from government and private schools participated. Tiny-tots of Kiddies Paradise, Kochar Market, celebrated ‘Raksha Bandhan’, in a unique way- here today. The students were excited about the gifts they received. 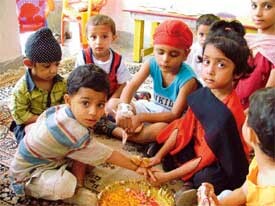 In the school premises they were taught how to perform Rakhi pooja. They also made greeting cards and rakhis and sang songs. The District Legal Services Authority yesterday organised a Lok-Adalat to settle motor accident claim cases, under the supervision of its Chairman, Mr Baldev Singh, District and Sessions Judge. Dr O.N. Bhakoo, former Head of Paediatrics, PGI, Chandigarh, expressed concern at the receding interest of medical fraternity in attending conference, which play an important role in updating knowledge and could improve the quality of medical facilities in the country. The Jagraon district police organised a multi-dimensional camp and a seminar at Government Senior Secondary School in Chhappar village. Mr Rajiv Ahir, Senior Superintendent of Police (SSP) posted at Jagraon, presided over the seminar on “Drug de-addiction and eradication of hepatitis-B”. The cricket grounds at the local Satish Dhawan Government College for Boys have hosted a number of matches, including some inter-varisty and Ranji encounters. In 1999, the ground was “hijacked” by some political parties and rallies were organised at the venue. Pooja won the first position in the sub-junior category of under 20 kg in the seventh District Karate Championship here today. The championship was organised by the District Ludhiana Karate Association at A.S Senior Secondary School here. The function was inaugurated by DSP Des Raj. In the 46 to 50 kg girls category, Amandeep Kaur got the first position, Babita second while Gurminder Kaur third. The meeting of the parents of the wards who attended the coaching centre being run by the Ludhiana District Cricket Association (LDCA) here on Sunday ended in a huff. The meeting ended without arriving at any conclusion. Ramgarhia Senior Secondary School, Miller Ganj, and Teja Singh Swantantar Memorial Senior Secondary emerged as champions in the boys’ and girls’ sections, respectively, in the 4th Ludhiana District Softball Championship which concluded at the Ramgarhia Complex here today.